I have this bloggy friend and she is totally adorable. And funny. OMG, she is funny. 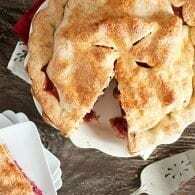 We’ve sorta been reading each other’s blogs forever now and this probably isn’t the first recipe I’ve snagged from her site to share on my own. It’s not stealing if you’re friends. It’s borrowing, people. Borrowing. 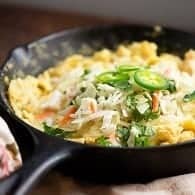 Even if it was stealing, and it’s not, some recipes are just plain good enough to warrant a little theft. I admit to nothing, though. Y’all know how I like to get bossy, so let me plan your day for you. 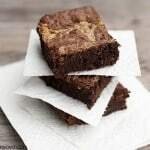 Second, while your cookie bars are baking, head over to Shelly’s blog and waste your day reading her hilarious stories and drooling over her amazing recipes. Just don’t get so caught up in her little world that you burn your cookie bars. That’d be sad. Third, spend the rest of the day eating cookies. No laundry. No dishes. No cooking dinner. 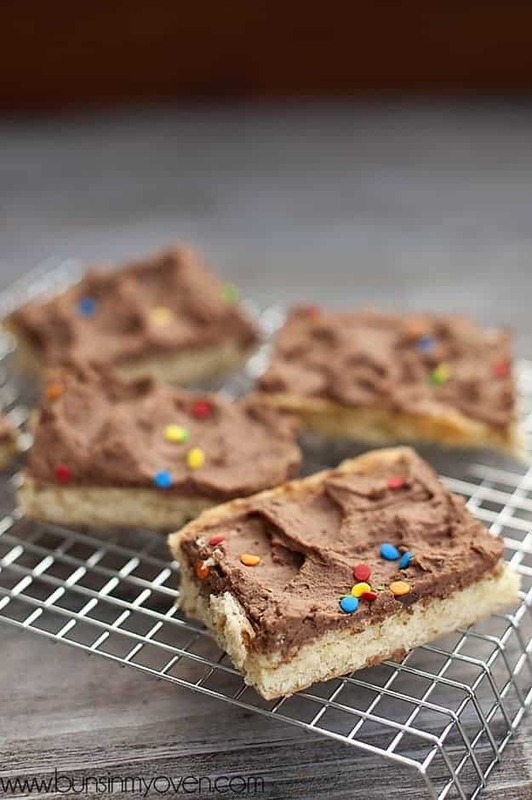 I topped my cookie bars with a simple chocolate frosting this time around, but I’ve also topped them with buttercream (Here is a link to Shelly’s favorite buttercream recipe. It’s also delicious. Much like her cute little face.). Either way, they are delicious and absolutely perfect for large get togethers. Just be sure to have a copy of the recipe ready, because people will totally want to steal borrow it from you. 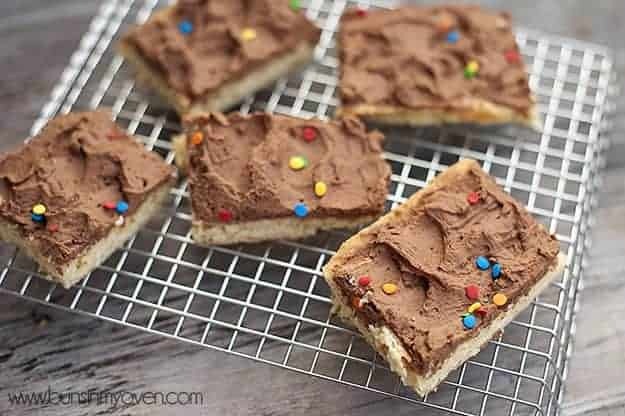 I topped my cookie bars with a simple chocolate frosting this time around, but I've also topped them with buttercream. Either way, they are delicious and absolutely perfect for large get-togethers. Line a jelly roll pan (15x10x1) with aluminum foil or parchment paper and spray with cooking spray. In the bowl of your stand mixer, cream together the butter, cream cheese, and sugar. Beat in the egg and vanilla until well incorporated. With your mixer turned to low, add in the flour, baking powder, and baking soda, mixing until just combined. Press the dough evenly into your prepared pan. The dough is sticky and it will look too thin, but it all works out. Just keep pressing it until you have an even layer over the entire baking sheet. Bake for 20 minutes until edges begin to turn golden. While the cookies are baking, prepare the frosting. Add sugar, butter, and milk to a small saucepan over medium heat and bring to a boil. Boil for exactly 60 seconds and remove from heat. Stir in chocolate chips and continue stirring until the chocolate has melted. Place the mixture in the bowl of your stand mixer and place in the refrigerator to cool. When the mixture is mostly cool (it can still be a little warm, but not too hot or it won't whip - just return to the fridge if you find it not whipping good), place the bowl on the mixer and, using the wire whisk, whip the mixture with the powdered sugar until soft and fluffy. If needed add a bit of milk or heavy cream (up to 1/4 cup). 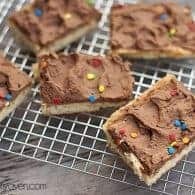 Spread over the cookie bars. Could I make the frosting without the chocolate chips or would it change the texture too much? Second, I don’t think it’d work. The frosting really needs the melty chocolate to thicken up. You could certainly try it, but I don’t have high hopes for it. I do LOVE chocolate…alot…but I also love the regular Lofthouse frosting. That’s the only reason I asked! @Sarah, Oh, whew! I’m so glad we cleared that up. I think plain buttercream frosting is what you’re looking for. The creamy white vanilla canned frosting would probably be similar too! Well, I love you. And borrowing is totally fine, especially when followed up with copious amounts of praise. I thought maybe all the nicey-talk would help things along. yum!!! 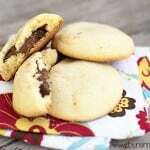 I made the copycat cookie version for Christmas and they are just as good as everyone is saying. Can’t believe I haven’t tried bar form yet though! Oooh, what a great one to share. I’m thinking I need to get to the store asap! Ok, so I started reading this, got to the instruction to go read Shelly’s blog and went “oh my God I can’t subscribe to another blog!”…and then I went there and I already subscribe! And I agree about the awesomeness – though I’m going to have to take your word on the delicious face thing. I try to avoid licking strangers whenever possible. @Andi, I don’t get the chemical taste either, but that waxy/greasy film, yep. I have not bought them in a long time, even though every time we pass them in every store my little girl has to point out how they are her favorite cookie. Well guess what? Mine too and they talk to me while you are at school and then I have to eat them to silence them. 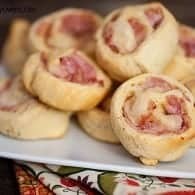 I will make these as soon as lent is over and/or I lose these last 6 pounds. I just made these and had to package up more than half of them to take to drop off at church tomorrow. I can’t keep these in the house or I will EAT.THEM.ALL.! Between you and shelly, I do a whole lotta drooling each and every day! I can’t eat those cookies either…ga-ROSS. Homemade bar form, though…that I can totally dig! 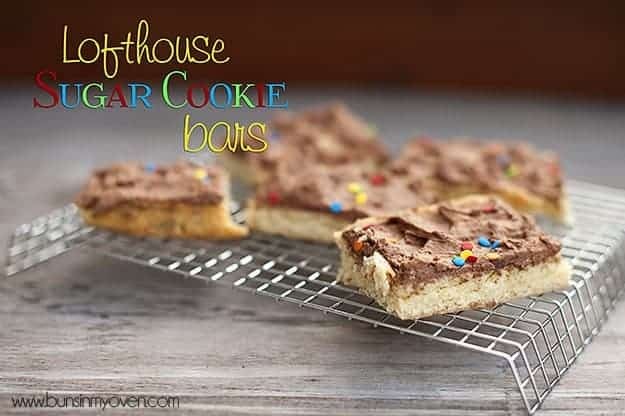 Great idea to top them with chocolate:) YUM! Yum these look amazing! I’ve made something similar before and actually have recently been thinking a lot about making them again! Made these for Easter. Made one batch, but didn’t realize the oven wasn’t hot enough. When they were barely brown I took them out and found out the next day the whole pan wasn’t cooked enough… The whole thing went in the trash. 🙁 Tried it again the next day, adjusted the temp, (yes I have an oven thermometer, just forgot to check before), and this time set it for 20 miinutes before I checked. Should have checked 2 minutes sooner! They were already getting brown. Thankfully they are thick enough that they were still soft, just slightly overdone. I will definitely check sooner next time. ( I also used a thin aluminum pan the first time and then used a dark one the next time. Do you think think that made a big difference? I usually use aluminum for baking but don’t have a good one that’s jellyroll size!) Oh, and for some reason I also added 2 extra tbsp of flour the second time. Probably shouldn’t have! I also used a half teapoon lemon extract and 1.5 tsp vanilla, (next time may do a whole teaspoon of lemon!) Gave it a nice fresh, light taste. Used Shelly’s butter cream recipe, but halved it and it made plenty for the bars. Added one tsp lemon extract to that. Soo good! Colored it yellow and put pink, purple, and green sprinkles on it! Such a great recipe! I gave most of them away today after eating 2 for breakfast! Sugar cookies are my weekness! I love that you don’t have to roll them out! This is definitely going into my go- to list! Thanks! !